Last week was crazy busy. One of my good friends, Kim, and her kids came over and helped me rearrange some stuff in our house. Kim has a knack for organizing and optimizing space. We switched our craft/playroom with Anthony’s (12 year old) room to give him more space for his bunk beds. I am very pleased with the way it turned out. So is Anthony. Then my sweet friend Tiffany, who I have been friends with since the 6th grade, visited us Friday night with her three littlest kids. (Her three older kids were at youth group at church.) 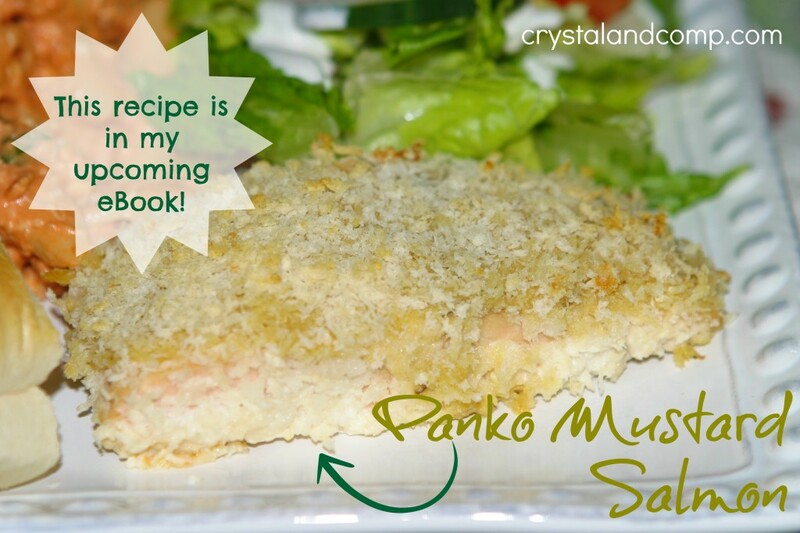 I made the Panko Mustard Salmon and a super creamy and fattening pasta while she was here. OUT OF THIS WORLD! Here is a quick look at it. This week we also start back our homeschool routine. We use the Sonlight curriculum and Anthony will begin 6th grade this week. This year he will focus on the Eastern Hemisphere and how God’s word needs to reach the entire world and not just the United States. Lots of History and Biblical learning. There will also be a great deal of classical reading- chapter books as read alouds as a family as well as reading independently. We will also focus on Health, Medicine and Human Anatomy during Science. I am a wee bit nervous, but excited to learn along the way as well. Overall this curriculum goes into more detail than I ever learned as a child. Especially when it comes to World History. On to my weekly meal plan this week with real easy recipes to make dinnertime smooth. That is what I need for a busy back to school schedule. What about you? Crockpot Stuffed Meatloaf– meatloaf stuffed with mashed potatoes. This is a recipe my mother-in-law shared with me and I am going to try it in the crockpot (she cooked it in the oven). The key ingredient is V8 juice. Served with steamed veggies and a dinner salad. <<—— Carry over from last week. Going in the crockpot today! Basil Feta Chicken in the Crockpot– we LOVE this!!! My house smells so good when this is cooking. I am doubling the garbanzo beans to stretch it out a bit. I am serving it with couscous and rolls. Spaghetti with Meat Sauce in the Crockpot– served with fresh fruit and rolls. Breakfast Burritos– these are so awesome and so easy. I made these while we were visiting my in-laws last weekend and they were so delish! Perfect for breakfast or dinner! I will share the recipe once I make them this week. Vodka Chicken Pasta– yum! Served with a dinner salad. Leftover Buffet– use ’em up! Also, my brother, who has been working out of state since May, is coming into town this weekend. So excited to see him. We are going to have a family get together and all spend some time catching up. I am taking two dips to the get together. I think I’ll embark on a 7 layer dip, maybe? Have not decided yet. Maybe my Crockpot Artichoke Dip? This week when you cook dinner Instagram your photo and hashtag it with #howtomealplan. I would love to encourage you to repeat dinnertime success over and over again all week long! I cannot wait to see what you’re cooking! And, if you struggle with meal planning, make sure you check out my How to Meal Plan eBook. Want more meal planning inspiration or ideas? Check out OrgJunkie where hundreds of bloggers share their meal plans every Monday. Also, don’t forget your printable coupons to save even more on your grocery bill. Make sure you print out my free printable meal planner that is themed for back to school! Love it! Now is the time to fill your weekly meal plan with real easy recipes! Back to school is here for many states, and for others it is right around the corner. Back to school also means Fall weather and that brings comfort food! I am so excited for the weather to cool off and to bake casseroles and such again. What about you? I would love to know what’s on your meal plan this week, too. Leave it in the comments. 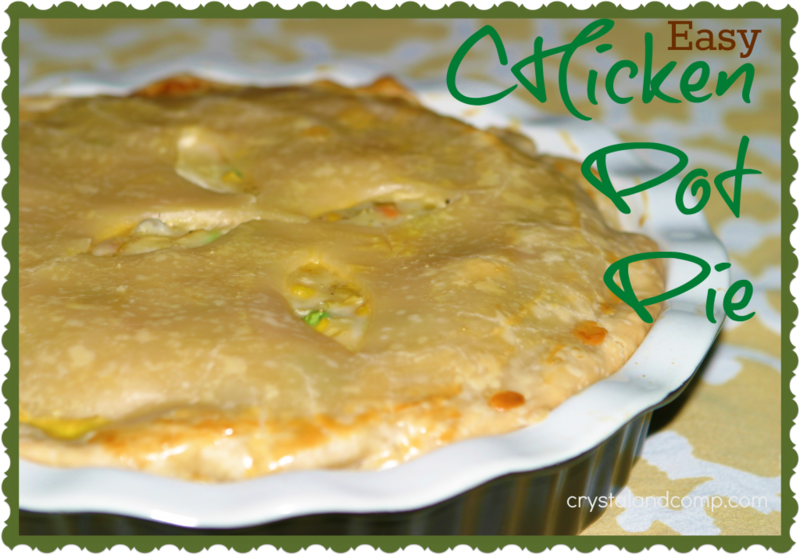 Chicken Pot Pie– served with fresh fruit and a dinner salad. Crockpot Stuffed Meatloaf– meatloaf stuffed with mashed potatoes. This is a recipe my mother-in-law shared with me and I am going to try it in the crockpot. Served with steamed veggies. Chicken and Summer Squash– served over steamed rice with a side salad and carrot sticks. Turkey and Bacon Sandwiches– served with baked chips and apple sauce. I have been publicly meal planning successfully for almost three and a half years here on Crystal & Co. Without a meal plan my family would not have supper together at the table. It is essential for me to ensure that we stay out of the drive thru lines. Do I ever fail. Absolutely. We all get sidetracked. But, I created a how to meal plan method that I stick to and it brings me success over and over again week after week. One of the things I encourage you to do so you can save money on your grocery bill, is to always shop your pantry, freezer and fridge first so that you know what you have on hand and you do not over-shop or under-shop. There is nothing more irritating than to prepare a meal and realize you did not have everything on hand and you should have grabbed a certain ingredient at the grocery store. There is also nothing more ineffective when it comes to saving money than to buy duplicates of items you already have at home in your pantry. With meal planning, you should be saving time and money at the store. Something new I am offering here at Crystal & Co., each Monday is the Target Weekly Ad so you can shop the circular to save even more on your grocery bill. 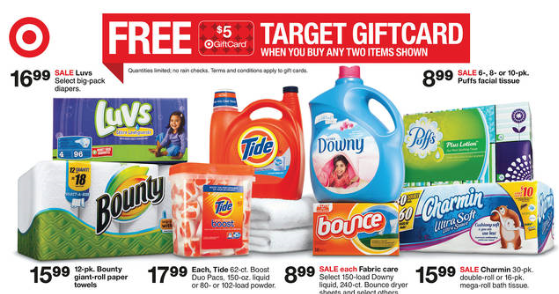 This also includes printable coupons that can be used at Target to save as much money as possible. I know that many folks also find Walmart to be a great place to grocery shop as well. So we are offering a weekly round-up of Deals at Walmart that are $1 or Less.You read that right. There are so many things you can get at Walmart for less than a buck every week. Again, these posts include printable coupons and deal scenarios. 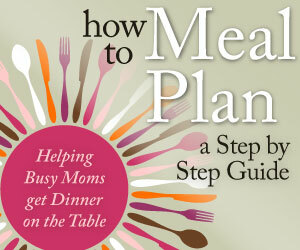 It is my goal to help make meal planning as simple as possible for you and save your family some money in the process. Ready to see the easy recipes I am feeding my family this week? 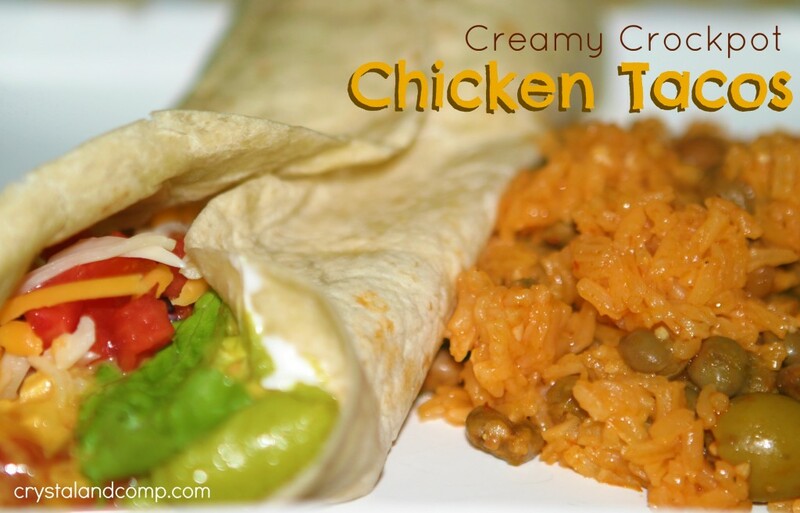 Creamy Chicken Taco– served with Puerto Rican Rice. Yum! Crockpot Chili Grape Chicken– served over coconut rice with an easy side salad. There is a recipe where you take meatballs or smoked weenies and cook them in the crockpot with chili sauce and grape jelly. I am going to try cooking chicken this way in the crockpot. I am thinking it is going to be very tenderized and savory sweet. If the recipe comes out well it will be in my upcoming eBook that shares 21 Easy Recipes. Crockpot Chicken and Noodles– served with fresh fruit, carrot sticks and dinner rolls. Sheppards Pie– this is an all in one meal. Cheesy Chicken Salsa Skillet– so good! I love how quickly this all in one meal comes together! Leftover Buffet- use ’em up! This week when you cook dinner Instagram your photo and hashtag it with #howtomealplan. I would love to encourage you to repeat dinnertime success over and over again all week long! I cannot wait to see what you’re cooking! Also, don’t forget your printable coupons to save even more on your grocery bill. And, shop for deals at Walmart and the Target Weekly Ad.